Find a Legacy Classic retail store in your local area using our dealer locator. 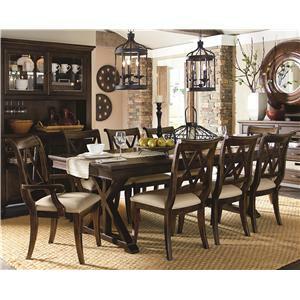 This nine piece dining set has a simple sophistication that's perfect for a relaxed or formal gathering. The trestle base of the table gives the piece a casual silhouette, while the rich Amber finish and clean lines establish a truly refined appearance. Enjoy a meal with family and friends around the rectangular top, which extends to fit up to eight people. 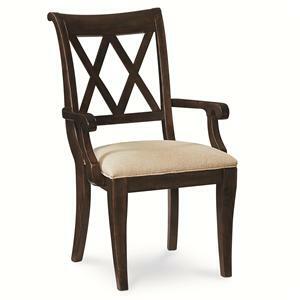 Seat your guests with the included X back side and arm chairs. The double X back and tapered legs highlight clean contemporary lines and fresh detailing, while a curved back and slightly scrolled arm give the piece a formal quality. 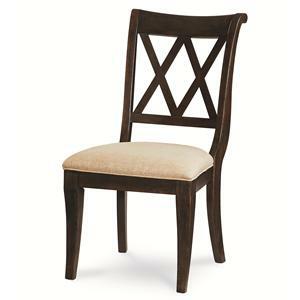 Sit comfortably in the upholstered seat, which features a classic oatmeal-colored fabric that looks elegant against the amber finish. A beautiful blend of contemporary and traditional design elements, this dining set transforms any dining area with transitional sophistication. 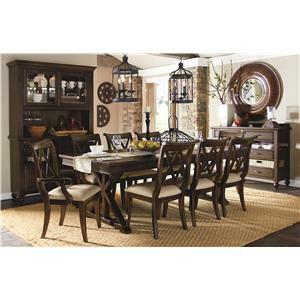 The Thatcher 9 Piece Dining Set with X Back Chairs by Legacy Classic is available in the area from FMG - Local Home Furnishing. 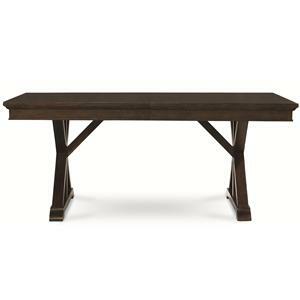 3700-621K Trestle Table 1 40" 76" 30"
3700-141 KD X Back Arm Chair 2 23" 26" 38"
3700-140 KD X Back Side Chair 6 20" 26" 38"
The Thatcher collection is a great option if you are looking for Transitional furniture in the area. 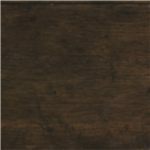 Finish & Paint Options Available in a warm Amber finish. Handles & Hardware Collection features custom designed bar pulls and knobs in a dappled Ebony and Bronze.